Once again, I went into the last week of the season in line to see 100 games in a year. This year, I had seen 90 games through 17 weeks with Texas’ planned ten championship games remaining. 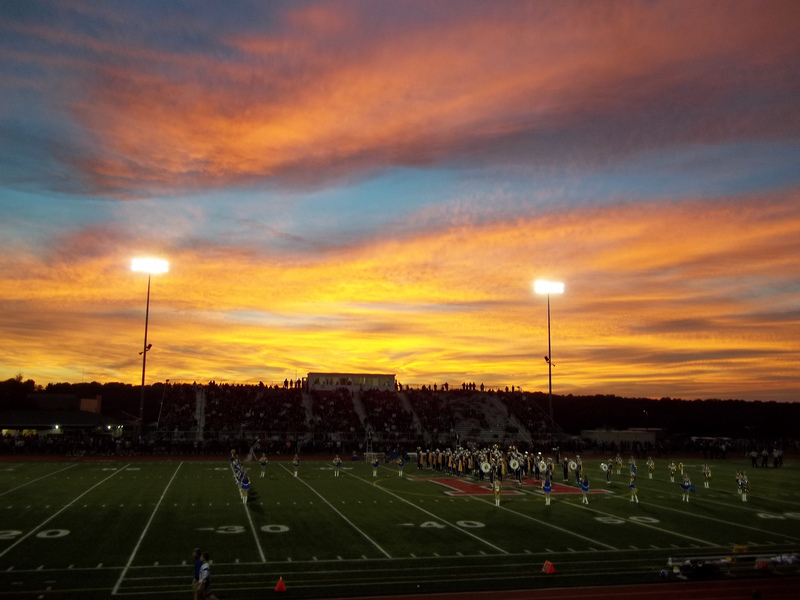 For the third year, I drove to Arlington, Texas for those games and must admit it should be on the bucket list of any high school football fan. After the Cedar Hill-Katy game, I had totaled 100 games for the second straight year. As I’ve done the past few years, this is a breakdown of my travels. This year I had seen games in 9 states and 1 province. I saw games in 18 different weekends. My season started in Nicholasville, Kentucky and finished in Arlington, Texas. I watched games in 46 different venues and saw 177 different teams play. Of the 100 games, 98 were complete games and two were finishes after other games nearby had ended. In games I’ve attended, there 4,977 total points scored for an average of 49.77 points per game (0.18/game less than last year). The average score was 34.25-15.52. In total there were 12 shutouts and the most points scored was 63 (as opposed to 7 shutouts and 66 points as a high last year in 100 games). Only four teams scored over 60 points. Unlike last year, I only witnessed one overtime game. No games were called early for weather. Although I did have three games postponed due to weather that I had planned to attend (Williamsville North vs. Williamsville East in New York, and the two PIAA Championships on Saturday, December 14). Most games witnessed in one week was 15 in Week 14 (Tuesday through Saturday). Also 10 in Week 17. And 8 in Week 1. Fewest was 2 in Week 16 and 3 in Week 6. I saw 27 state championship games, 7 provincial championship games, and 16 other playoff games. Saw 148 different teams once. Saw Greenville (PA) eight times. Saw Sharpsville (PA) and Sheffield (PA) three times. Saw Pittsburgh Cardinal Wuerl North Catholic (PA), Pittsburgh Woodland Hills (PA), McKeesport (PA), Bedford (OH), Shaker Heights (OH), Stoneboro Lakeview (PA), Mercer (PA), New Bethlehem Redbank Valley (PA), Curwensville (PA), Warren JFK (OH), Greenville Reynolds (PA), and St. Marys Elk County Catholic (PA) twice each. *-Honorable mention to C.W. North Catholic-Old Forge tied 7-7 through regulation, finished 15-14 after first OT. As I’ve done each year, this is my opinion on the quality of the teams, fan support, state organization, etc for the states (and province) I’ve seen games in. Once again, Texas wins. Ohio is a close second, again. Texas is once again top dog. And it’s not just the fan support at the biggest title game. Even the small title games draw huge crowds. 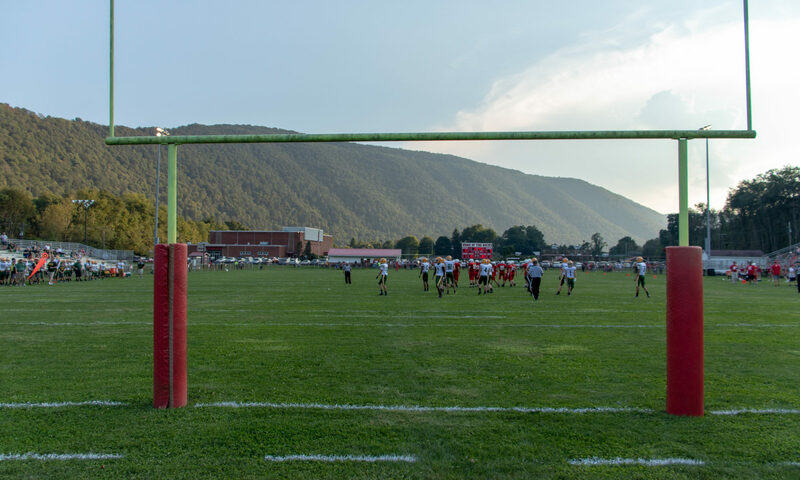 For two reasons: the small towns show up in droves for their high school games. And there’s a good number of neutral fans who show up because there’s games being played. Next is Ohio, that generally supports their teams very well from top to bottom. Unfortunately, in Ohio, the attendance declines once the playoffs start for several reasons. Both the weather and games being televised live keep neutral or unenthusiastic fans at home. The Texas games have just recently started playing at one site, and have just recently started airing games live on television. Now, in the lower levels. Michigan greatly surprised me for turnout to the championship games. Luckily the games were indoors as they’ve been for many years. But, they are aired on live television. Most remarkable were the fans from the Upper Peninsula (Ishpeming and Menominee) who made the trek down to Detroit for the games. Pennsylvania again falls to the bottom of the upper echelon. Most schools will garner a decent turnout. But, I think in a lot of areas a shrinking population means also an aging population. Which means fewer people to turn out. In the mid-range, we have Kentucky and Tennessee. Eastern Kentucky had a good crowd for their Pike County Bowl games. Bowling Green hosted a bowl at Western Kentucky University’s L.T. Smith Stadium. Attendance is decent and vocal, but nothing spectacular. Tennessee oversold their stadium for a game on a Sunday airing on ESPN. The TV draw and novelty helped. As was the fact it was a big rivalry. However, this was tempered by such a horrendously small stadium. Though not the stadium’s fault, the fact they built a stadium so small indicates that they don’t get much in attendance generally. This stadium, for a large school was something a single A in PA or a Division 6 in OH would have. Then the bottom of the group. New York had decent turnouts for games that in most states would be the equivalent of second round game in most other states. Maryland and West Virginia were nothing spectacular. I do know that West Virginia is being unfairly dropped here due to the matchup, game date, and playoff implications, but there’s no higher slot for them to me. And lastly is Ontario. Don’t ever confuse the great white north with a football hotbed. A few schools had decent crowds. But the fact this games are scheduled mid-day and mid-week indicate fan support isn’t a big concern for them. A 2,000 seat stadium never came close to being sold out. And one game kicked off with 43 people in the stands before filling up. There were some monster travels for teams, including almost 900 miles for Thunder Bay to Toronto. Two years ago, I had Texas slightly behind Ohio. Then Texas slightly ahead of Ohio. This year was a down year for Ohio. Using the state championships as a guide between Texas and Ohio, Ohio is hamstrung by some evenly matched teams that aren’t huge standouts. Especially at D1 through D4. Pennsylvania is high on the list, but isn’t even close to Ohio or Texas. The only comparison was Warren JFK against Sharpsville, which Sharpsville did win. However, Warren JFK is not good. For the mid-range, Michigan, Kentucky, and Tennessee are all close. Below them are Maryland and West Virginia. Neither really wowed me. West Virginia has never wowed me. And even for the level I was watching, it wasn’t good. Maryland just wasn’t the greatest. The teams weren’t considered ‘bad’ in the area. Urbana went on to the playoffs and from I read did decent. Then, we have New York. This was a different level of bad. Even the Catholic schools in the MMAA didn’t make up for lack of quality. New York just isn’t the bastion of high quality high school football. Part of the problem is how little regard it’s given state-wide. Long Island and New York City did not participate in the state setup. Nor does the New York City and Buffalo area Catholic schools. They only play a seven game regular season. And they let in way too many teams to the playoffs. And at the bottom, is Ontario. It’s hard to judge based on the differences in game play. But, Lorne Park got blown out on the road at Dover (OH) and were one of the better teams I watched (along with W.F. Herman and Huron Heights). (1) is just amazing because of the crowds. It’s a fun trip down and back. It’s domed to protect from the weather. Which generally is nice and warm for that time of year. (2) also gets the benefit of the dome. Crowds were loud because of it, weather was nice, food options were good, and you get eight games. (3) was fun, though. Nice venues. Beautiful surroundings in the eastern mountains of Kentucky. (4) was just another great trip. Traveling to Canada. The games were mid-week to allow more games before and after. Small venue though, but small crowd. Easy to get in and out. (5) is always fun, but the travel between venues, added cost of all the tickets just limits it. Plus the matchups and blowouts/shutouts limits enjoyment. (6) was good for what it was. It was cheap tickets, free parking, and six games in two days. (7) WPIAL Finals earn their place for having four games and only a short trip to get there. That’s about it. (8) is dropping fast. No four-game event, only doubleheaders but did have games on Wednesday and Thursday. Much more enjoyable being in Kentucky the next two days than hang around Cincinnati again. (9) was a good atmosphere in a large venue, but the games weren’t good. Crowds were also small and Kentucky in August isn’t exactly comfortable in direct sunlight. (10) was cold, but same crowds as the Section 6 Finals. Only reason to drop was the drive for only two games and I think this game is why I got a really bad cold that kept me from going to the title the next Thursday. (11) I’m not sure why I thought this would be much different than last year. They played it at East Jessamine this year, and the stadium still isn’t any better. (12) Postponing two games dropped this to the absolute bottom. The stadium already is horrible with small crowds. The first game is Pikeville-Hazard. Hazard almost made a monster comeback, down 56-28 halfway through the fourth quarter. If not for a final failed onside kick lead to Pikeville’s last score, and a 62-50 final. The next week, Greenville trailed at defending District 10 Class AA champion Hickory 21-0 at the half. With a safety and three touchdowns, Greenville won improbably 22-21. It was the springboard to an undefeated season. The next day was the lowest scoring game I’ve seen at 6-0. A defensive struggle by both teams, Mercer also got the opportune stop when Sharpsville was moving the ball. Meanwhile, Mercer got one big play for the touchdown and made it count. The fourth game was the best of the year. Canton McKinley trailed 10-0 late in the game when a long touchdown finally made it a game. An onside kick and a very quick drive made it 10-7 as Canton McKinley lined up for a game-tying field goal. In a fake to end all fakes, the Bulldogs threw a touchdown pass with no time on the clock to win, 13-3. The next week, Sheffield defeated Smethport to win the AML North. It was their first league or division title since 1964. The crowd was electric at Wolverine Mountain. Next up was a great back-and-forth game with South Fayette pulling the upset over highly regarded Aliquippa. Next was Archbishop Moeller in their insane 55-52 win over Mentor. Neither team exhibited good defense. Mentor’s big problem was an early mistake that they chased the entire game. The last three were at the UIL Finals at AT&T Stadium in Arlington, Texas. First was Denton Guyer’s championship defending win over San Antonio Brennan. Brennan has only been in existence three years and had yet to graduate their first full class. This game was memorable to me because I follow Denton Guyer as my big school team in Texas. Most of the shutouts were boring affairs. These five get listed. Madison-Geneva in the rain that was 30-0 almost made the list, but with an umbrella and poncho it wasn’t bad. A surprise is Beech-Station Camp. Close game. But an absurdly small stadium where I had to stand about 30 yards behind the endzone and partially blocked view because of the scoreboard. Got sunburnt. Hardly any wind. Heat was a factor three days later at Sheakley Athletic Center. This game was one-sided, though Mt. Healthy never really puled away. It was hot, little wind if any. And the rain had made it muggy. Greenville-Saegertown was because it was horribly one-sided. A bloodbath was known well in advance. Saegertown was a former 1A team that was bad that got bumped to 2A for a cycle. Greenville went easy and was subbing in the first half, but it was still 43-0 at the break. The second half was mind-numbing. A running clock, constant running by Greenville, clearing the bench for players. Saegertown did get their touchdown which was good for them. But, it wasn’t an entertaining game. Trinity-Western Reserve on the last game of the last regular season week was a rainy, cold, windy night. One sided, and an unfortunate injury delay that just extended the misery. And the last game that really was boring was the night cap for the OHSAA State Championships. Marion Local-Trimble was already a one-sided contest before kickoff. And Trimble never could muster an offensive threat and Marion Local slowly ground out several scores that felt like they were extending the game by scoring as Trimble was in no way going to score. Throw in that the game was played overlapping the Big Ten Championships, a horribly small crowd, cold, and one-sided. One of the least intriguing or memorable games of the year. For the fourth year, I just can’t rank the teams myself. Too many to consider. So, I’ll use calpreps ranking for each of the teams I saw (using OHSAA naming conventions). I did not see 6-, 8-, or 9-man games this year. The Ontario teams are listed with the Canadian rankings via CFC. This is a poll, and not a computer calculation. Ontario has by far the most teams, roughly 300, of the Canadian provinces. There’s about 500 teams total in the country. And British Columbia plays 11-man American rules while the rest of the country plays 12-man Canadian rules. Because I’m so close to Ohio and Pennsylvania football, I don’t generally list the states for either in my listings. If there’s a chance of confusion, I tend to favor listing the Ohio team without a state abbreviation, and the Pennsylvania team with one. Seeing Pennsylvania teams listed under the OHSAA style is a bit odd, as there is zero history of marking teams anything other than their ‘advertised’ name. Which is also why I do not include “Area” in Pennsylvania school names. For instance, Greenville is listed as Greenville Area by the state, but the school’s name is officially Greenville Junior/Senior High School. The football team recognizes themselves at Greenville High School. The school district is Greenville Area School District. As for the rankings themselves. I’d definitely list Allen at the top. Moeller was good, but I would expect them to be a little lower on the list nationally. Carthage and Kilgore both surprised me with how high they were listed. They were good, but they’re smaller and would assume they’d be more likely to lose to many of the bigger Texas or Ohio schools than where they were placed. In years past, I had documented my week-to-week expenses but never really remarked on them. Because I’m based more in Eastern Ohio and Western Pennsylvania the past two years, my games are less business oriented travels and tend to be around the area. Any games I’ve been to now are purely because I took the initiative and drove there. For 2013, I documented my travels for all 100 high school football games and 8 of 9 NFL games (Browns-Steelers in Pittsburgh was after the High School season ended). Between August 21 and December 24, just for football games, I drove 14,863 miles. I purchased 624.011 gallons of gas costing a total of $2,027.94. For an average price of $3.2498 per gallon. My three cars I drove averaged 23.818mpg. Not counting the cost of my Browns season tickets, I spent $5,126.94 to attend 100 high school games and 8 Browns games. That averages $47.47 per game. Including the Browns tickets of $1100, I spent $6,226.94. Part of the uptick from last year was more hotel rooms and more travel for games. Last year, I didn’t plan on attending a particular number of games. By sheer odds, I ended with exactly 100 games. Same as last year. If it weren’t for three games being postponed, one game being sick, and deciding not to attend two Monday night games that were postponed, I would’ve been around 103 or 104. Three years ago, I watched 55 games. Two years ago, it was 73. In total, I’ve seen 329 games in four seasons. I’ve seen games in that time I’ve seen games in 28 states and 1 province. In the past four years, I’ve seen 83 state and 7 provincial championship games. An average of 22.5 per season. Now, I’m not sure what my plans may be next year. It all depends on a few factors. The Browns schedule, when particular championship game events will be held. And just general travel. I am planning on Texas again if it doesn’t interfere with another Browns home game. But, as always. I don’t know where it will take me. But, I’m sure I’ll have fun either way.